Experimental identification provides a valuable yet slow and expensive method for predicting novel miRNA genes. With the advent of computational procedures, it is now possible to capture characteristic features of miRNA biogenesis in an in silico model, resulting thereafter in the fast and inexpensive prediction of multiple novel miRNA gene candidates. These computational tools provide valuable clues to experimentalists, allowing them to narrow down their search space, making experimental verification less time consuming and less costly. Furthermore, the computational model itself can provide biological information as to which are the dominant features that characterize these regulatory units. Moreover, large-scale, high-throughput techniques, such as deep sequencing and tiling arrays, require computational methods to analyze this vast amount of data. Computational miRNA gene prediction tools are often used in synergy with high-throughput methods, aiding in the discovery of putative miRNA genes. 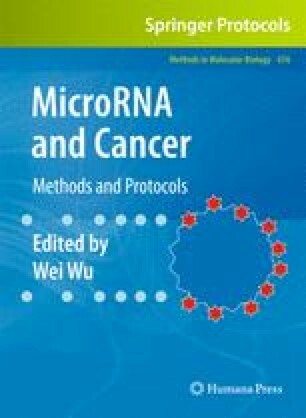 This chapter focuses on a recently developed computational tool (SSCprofiler) for identifying miRNA genes and provides an overview of the methodology undertaken by this tool, and defines a stepwise guideline on how to utilize SSCprofiler to predict novel miRNAs in the human genome. This work was supported by the action 8.3.1 (Reinforcement Program of Human Research Manpower – “PENED 2003”, [03ED842]) of the operational program “competitiveness” of the Greek General Secretariat for Research and Technology, a Marie Curie Fellowship of the European Commission [PIOF-GA-2008-219622] and the National Science Foundation [NSF 0515357].